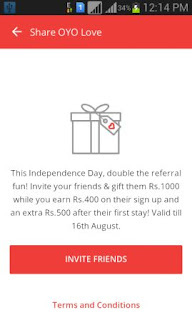 Hurry, Independence day offer valid till 16th August, get up to Rs 900 cash per Invite, just invite your friend and earn Rs 400 on their sign up with OYO app and another Rs 500 when they book a hotel room, your friend will get Rs 1000 OYO cash. Note: Don't forget to add the above referral code else you won't receive Rs 1000 OYO Money. OYO app don't check for device id, so you can make unlimited account in a single device. what you have to do is clear the OYO app data and create a new account with a new number and your referral code, you can use any E-mail id since it doesn't check for email verification. If you face any problem just comment it below, I will try my best to help you out.